Users access the assets that are stored in Elvis by making use of any of the client applications such as the Desktop client, the Pro client, the Brand portal or the InDesign client. For each user a folder is created for private use. This folder is located in the Users folder on Elvis and the user account name is used as the folder name. Permissions can be assigned to either a user or a user group. They can best be managed as much as possible on group level; this makes it easier to control and manage Permissions that need to be the same between end users. 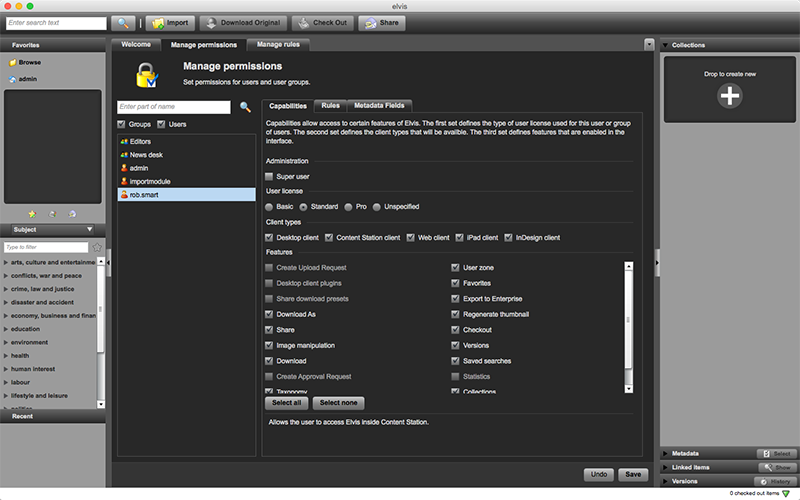 Permissions are managed in the Desktop client through the Manage Permissions tab (choose System > Manage Permissions). Figure: The Permissions tab in the Desktop client.